Quality logic controller is operated by activating & deactivating fans, curtains, heaters, cooling systems & alarm according to preset parameters suitable to control power, natural or tunnel ventilation houses. 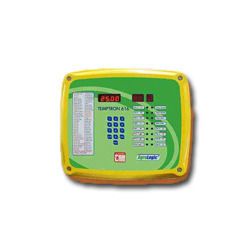 It is a stand alone controller equipped with keyboard & alphabetical LCD display. It is supplied with temp. and humidity probe. Also available with P.C. connectivity. Incepted at Mumbai, (Maharashtra, India), in the year 1983, we “Quality Systems & Equipments Pvt. Ltd.”, are a Private Limited Company, that is counted amongst the well-renowned Manufacturers, Exporters and Suppliers of the best quality Layer Battery Cage System, Breeder System, Broiler System, Environment Control System, Poultry Accessories, Manual Feeder And Drinkers, Egg Packer And Grader Machine, Wire Mesh and Green House Equipment. Under the efficient leadership of “Jairaj Thakker (Director)”, we have been able to achieve a remarkable and dynamic position of pride in the industry. Moreover, we export these products to Zimbabwe, Uganda, Algeria, Congo, Nepal, Bangladesh and Sri Lanka. We engaged in offering our products under the brand name Staalkat.